I don't know about you, but I like a President who can throw a funny, geeky sci-fi reference once in a while. Clearly, el Comandante en Jefe has watched his Terminators and scary Big Dogs a few times. 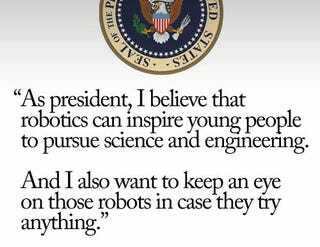 Obama said those words while presenting his "Educate to Innovate" campaign, which aims to promote the development of new inventions by students all around the country.